Snowdrop is located at about 5 o’clock on the loop called Columbine Drive in the Four Seasons section of the Warriors Mark neighborhood. The base of Peak 9 of the Breckenridge Ski Resort is due west and is a quick hike in summer or a short skate in the winter. The free town shuttle stops just outside the door and makes everything in Breckenridge easily accessible from any condo for sale in Snowdrop. Similar to other condos built at this time in this neighborhood, the Snowdrop condos for sale also includes several smaller, studio units the others condo complexes don’t have. Check out the available Snowdrop condominium listings available below, or read more about living in this desirable complex. The small complex has had a recent exterior facelift and its current exterior fits in well with the wooded surroundings that have been preserved in this neighborhood. Most of the units have balconies, and the top floor enjoys vaulted ceilings and large windows. The view of the Ten Mile Range can be good from many of the Snowdrop condos. Size: 471 to 1179 sq. ft.
Drive south on Main Street to last stoplight at Boreas Pass Road, turn right on Broken Lance Drive. At the three-way stop make a left and remain on Broken Lance, soon this intersects with Columbine, and just before this loop begins, Snowdrop will be on the right, between the Lance’s West and Christiana. 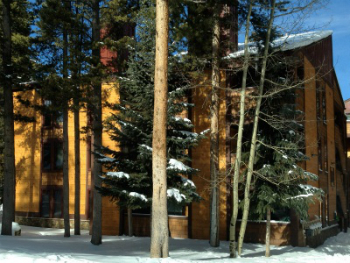 Contact the experts at Breckenridge Associates to discuss your real estate opportunities in Breckenridge.